Stable signal in Sofia on Jan.30 around 1530 till s/off at 1600. End of broadcast at 0810UTC of both frequencies. *confirmed on Jan.17 and 24, very good signal in Sofia on both frequencies. 1520: Excellent signal from Radio France Internationale in Russian on 13750 kHz, 500kW, 80 degress from Issoudun. 1524: A station with news reports in Urdu with very good signal on 9920 kHz. Various frequency lists show this is BBC from the Asia Relay Station in Nakhon Sawan. 250kW at 300 degrees which is towards Europe. 1525: The Overcomer Ministry with fair to good signal on 9930 kHz. This is 100kW at 318 degrees out of WHRI's Angel 3 in Palau. Over the past few months Brother Stair expanded its shortwave broadcasts and is now using transmitters of WRMI (the former WYFR relay station in Okechobee), WHRI (Cypress Creek and Palau), SpaceLine Ltd (Sofia-Kostinbrod) as well as WTWW, WBCQ, WWRB, WWCR, etc. Answering listeners' phone calls and talking about the planned bombing of Pearl Harbor which was done in order to involve USA in the Second World War, sending more than 5000 American militaries to the bottom of the sea. At least 15 seconds delay from the Media Broadcast transmission on 13810 kHz, which is blasting here, as usual. 1535: Radio Liberty with excellent signal on 9840 kHz, 100kW at 63 degrees out of Biblis, which is not towards Bulgaria but is always providing pretty strong signal at my location. 1600: Adventist World Radio with a program in Bulgarian language. "Advanced Bible" program with a discussion on the creation of the world. Excellent signal but strong fading at times - 55534. 1610: Voice of Iran with a program in Turkish language. Excellent signal but a bit undermodulated. 7415 - Firedrake and RFA at the same signal level. 250kW at 303 degrees from Tinian. 9455 - Firedrake jammer against Radio Free Asia in Chinese, which is also audible but under the Chinese. 100kW at 310 degrees from Agingan Point, which is also towards Europe. 9725 - 54555 - CNR-1 against Radio Free Asia in Uighur transmitting from Al-Dhabbaya, which is audible underneath. 1706: IRIB VOIRI in Armenian with very strong signal on 7230 kHz, but suffering from strong RTTY QRM and co-channel interference from CNR-1. 1710: Very strong and distorted signal, barely modulated with Arab music. It's Radio Cairo, of course. Transmitter frequently turning on and off. 1715: All India Radio in Russian with excellent signal on 9595 kHz, playing beautiful instrumental music. 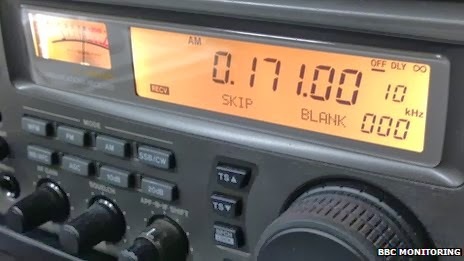 1745: Bangladesh Betar broadcast on 7250 kHz at 1745 are almost unusable. They suffer from strong intereference from adjacent channels: CRI in Esperanto on 7245 and CRI in English on 7255. Three transmissions targeting Europe within 15 kHz! 1800: KBS World Radio signing on 7235 kHz. Very good signal of the Russian broadcast, but suffering from very strong sub-audible heterodyne, most probably from Radio Ethiopia, which hasn't been causing such bad interference here in the past. Observations were made with Sony ICF-7600D and 20m longwire antenna. First program of Bulgarian National Radio "Horizont" was off the air on its mediumwave frequency 576 kHz earlier today, most probably due to transmitter maintenance. Everything had returned to normal on my next check at 1700 UTC. The power of the mediumwave transmitter of BNR on 576 kHz is rated at 400kW. It is supposed to cover the whole territory of Bulgaria with good quality signal round-the-clock. At night the signal reaches as far as Western Europe and Eastern North America. Russia has quietly switched off nearly all of its long-wave transmitters, ending almost nine decades of broadcasting - as cost finally catches up on the medium. At 1am on 9 January, state-run Radio Rossii wound up its broadcast as usual with the national anthem. There was no mention that long-wave transmissions were coming to an end, and the following day listeners found they had to rely on local FM broadcasts and the internet to hear the station. The only state radio station with truly national coverage, Radio Rossii can be compared to BBC Radio 4 with its mix of news, drama and educational programmes. Long-wave suited Russian broadcasters because a single transmitter could reach a wide area at all times of day and night. But they are expensive, and as most listeners have begun listening on FM, or through cable, satellite and the internet, the authorities decided to bring the service to an end..
Long-wave radio played a role in the Cold War, with the United States building a powerful transmitter near Munich and broadcasting its Russian service on the same frequency as Moscow's programmes. Listeners in parts of the Soviet Union found state radio drowned out by the Voice of America - the US equivalent of the BBC World Service. Now only one LW transmitter remains in the country, broadcasting Radio Kavkaz to the North Caucasus region on a limited schedule. 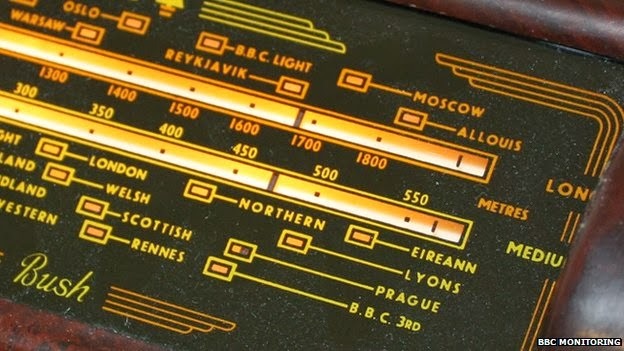 The BBC says that although it is planning to end its use of long-wave radio at some time in the future, there is no specific date for the closure of its Radio 4 transmissions on 198 kHz, much loved by listeners of the shipping forecast and Test Match Special. Sundays, 1200-1400 UTC, 9480 kHz. Voice of Croatia broadcast on medium wave ended on January 1st 2014, as HRT decided. This program was transmitted from transmitter site Zadar on MW (medium wave), covering Europe in time 18:00 - 00:45 (CET) every day. The programme can still be followed via satellite and the Internet. Due to Technical Problems MV Baltic Radio will not be on the air this morning. MVBR hopes to be back to there normal schedule next week. the mediumwave transmitters on 873 kHz (Lesnoy/250kW, Samara/100kW, St. Petersburg/75kW, Kaliningrad/50kW) are active, too. I can clearly hear them under Radio Moldova Actualitati, which is pretty strong at my location. The audio of the transmitters is not synchronized and is causing strong echo. the mediumwave transmitter in Grozny on 1287 kHz is active too, but it's carrying different program, most likely GTRK "Vaynah". Its power is rated at 50kW and provides good reception at my location. Radio Rossii regional broadcasts on shortwave as well as the European broadcasts on 5905, 6095, 7310 and 12075 kHz are still on the air too. Typical sound of Issoudun tx // 9565 TSH/TWN via remote receiver Hong Kong. The transmissions of Brother Stair are increased from 48 to 72 hrs per day!